Monty’s Deli commissioned us in late September 2016 to design their first permanent restaurant, to be located in an old bakery on Hoxton Street. We provided a full architectural service from Concept Design through Detailed Design, Tender and administration of the building contract, which was completed in early April – 6 months after we began work, with Xmas in between. From the start it was apparent that the 220sqm bakery had a story to tell. We could glimpse traces and hints of the building’s past and history under layers of more recent building work. We learnt that prior to the 40-year-old bakery, the space had been home to a well known Victorian butcher. Conceptually, we set out, as archaeologists might, to reveal the hidden layers that tell the story of this building. 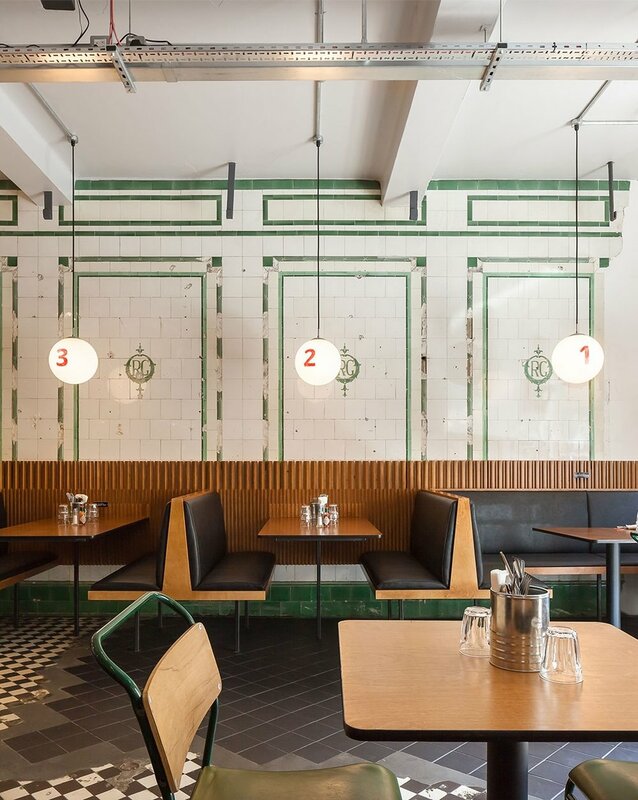 We wanted to expose and celebrate original Victorian features we knew to exist; Victorian tiles with butcher’s insignia, porcelain chequered floors and anything else we might uncover. The front of house restaurant design acts as a foil to the existing, historic building fabric. Our contemporary design and intervention in the space is largely limited to a ribbon wrapping around the perimeter. The ribbon begins at roughly 35cm above finished floor level, coinciding with the underside of booth seating, and stops at 115cm above finished floor level, coinciding with the top of the booth/ datum cladding and bar. Everything above and below these levels is historic fabric. It is the juxtaposition of contemporary elements with the original features that make the end product warm, soulful and distinct. — Mark Ogus, Co-Owner of Monty’s Deli Ltd.